At some point this year, I became obsessed with kombucha. I think it started when I got hooked on Ibotta (affiliate link). They always seem to have a rebate available for Kevita brand drinks, so I got into the habit of grabbing a couple each time I shopped for groceries. And then I started to make special trips to the store just to re-up on kombucha. And that’s when it became a problem — store-bought kombucha is not cheap. Well, I finally attempted to learn how to brew kombucha at home and got it right on the first try. 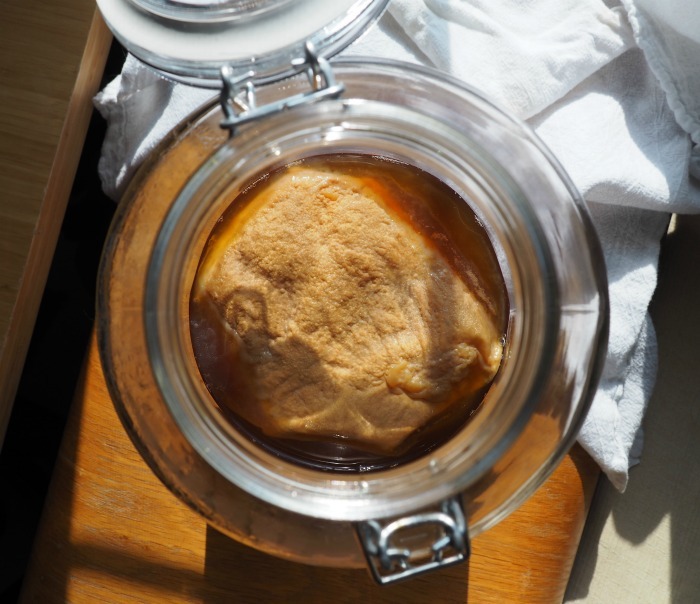 The first thing you’ll be doing is growing a SCOBY, or pellicle, from the store-bought kombucha. Step 1: Clean your gallon jar. Don’t use soap! You can rinse it with hot water, or a solution of water and white vinegar. Let it dry. Step 2: Bring about 2 quarts of water to a boil. You can use a kettle if you like. Step 3: Reduce heat to low and add 6-8 black tea bags (or equivalent in loose tea). If you used a kettle, use a large bowl for this step. 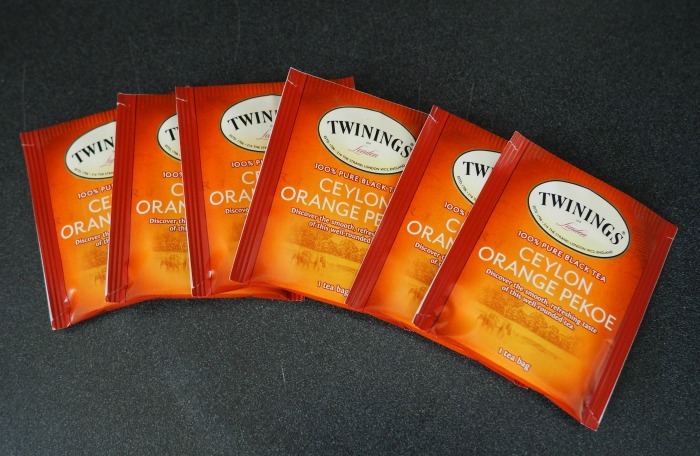 Step 4: Let tea steep for 10-15 minutes, then remove tea bags. Step 5: Add 1 cup cane sugar, then stir with a wooden or plastic spoon to dissolve. Step 6: Let the sweet tea cool to room temperature — very important! If you continue the process while the tea is too hot, you will kill the cultures in the starter tea. Step 7: While the sweet tea cools, drink most of the bottle of kombucha you bought, reserving about 1/2 cup. Make sure the reserved liquid includes the “crud” at the bottom of the bottle. That’s the kombucha culture you need to grow your SCOBY. Step 8: Once the sweet tea is completely cool, add it to the gallon jar, then fill the jar up with 1-2 more quarts of room temperature water. Pour in the reserved kombucha. Step 9: If your jar came with a lid, don’t use it. Instead, cover it with your coffee filter or cloth and secure with a rubber band. Step 10: Place the jar somewhere warm and dark and let it sit for at least a week. If it’s cold in your home, you may want to purchase a heating mat. I have been using this one and I like it a lot. You’re looking for a whitish-yellowish layer called a SCOBY to form over the top of the liquid in the jar and for the liquid to stop smelling like sweet tea and start smelling more vinegary. This could take anywhere from 7-14 days — the warmer it is, the faster it will happen. 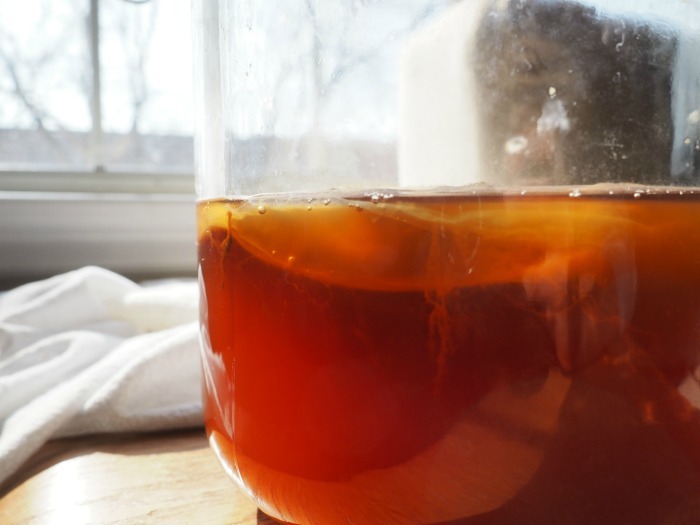 Once the SCOBY has grown and the sweet tea has fermented and turned into kombucha, you’re ready to brew a real batch of kombucha. 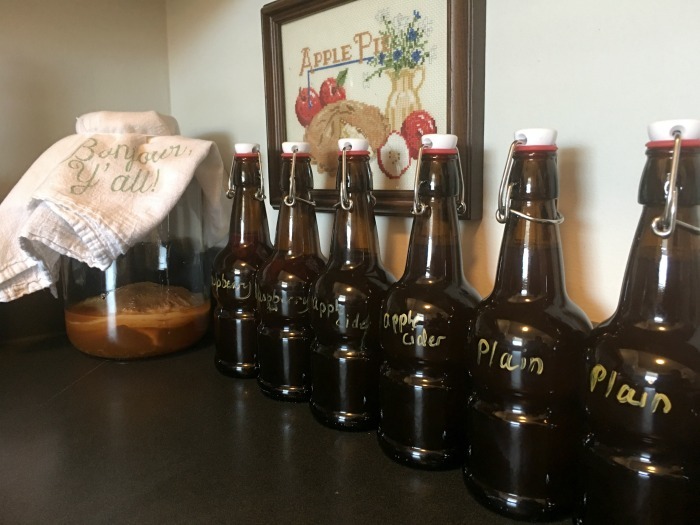 You are welcome to drink your starter kombucha, but it may not be as tasty as subsequent batches brewed with the new fully-grown SCOBY. 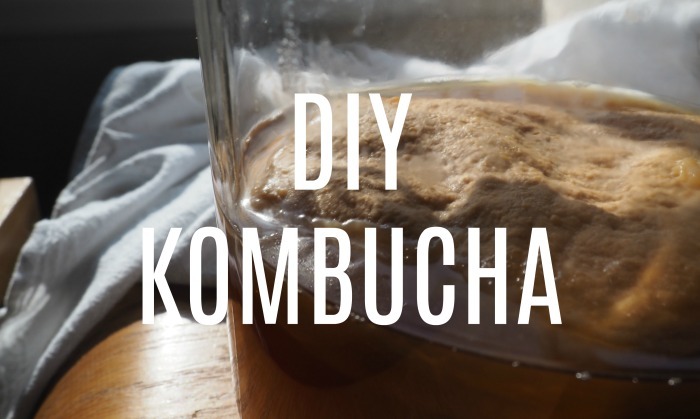 Wash your hands, then gently remove the SCOBY from the gallon jar and place it in a separate bowl along with 1-2 cups of the starter kombucha. Dump out the rest. Repeat steps 2-6 to make another batch of sweet tea and let it cool. Then add 1-2 quarts of room temperature water to the cooled sweet tea and gently add your new SCOBY and the 1-2 cups of starter kombucha. 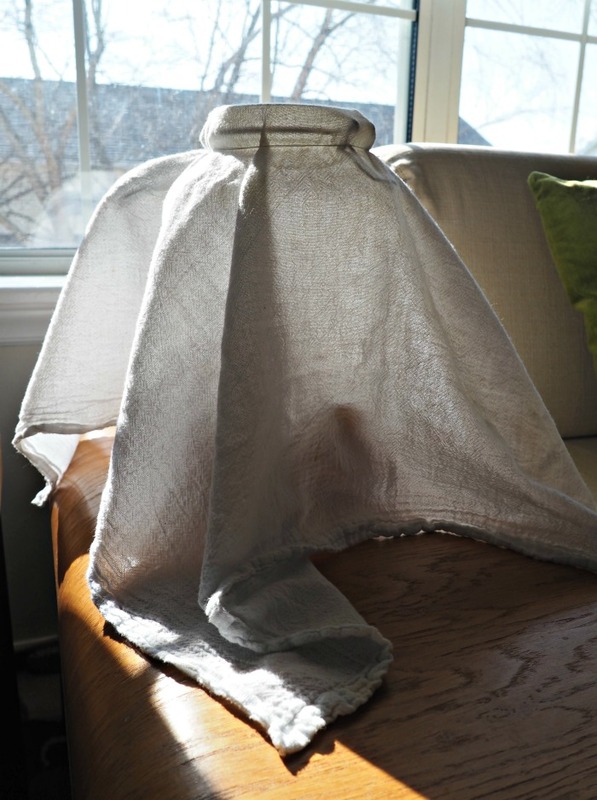 Cover it with your cloth or coffee filter and let it ferment for another week or more. You can test your kombucha by smelling it to see if it smells sweet or vinegary, or you can gently slide a straw down the side of the jar past the SCOBY and use your finger to pull out a bit to taste. It’s done whenever you think it tastes good! 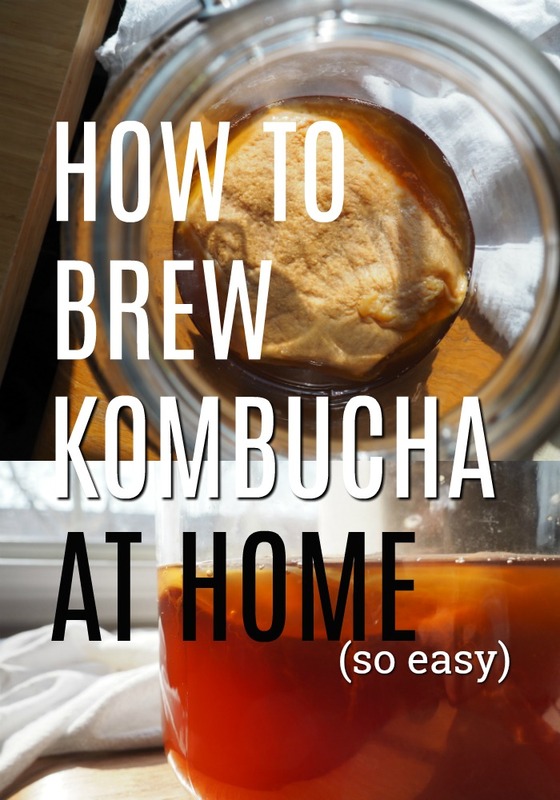 As long as you have a healthy SCOBY, you can continue to brew batches of kombucha for as long as you like. You can even bottle your kombucha in grolsch-style bottles like this and add fruit, fruit juice, or other flavorings like fresh ginger, to do a second fermentation. A second fermentation results in an extra-tasty, more carbonated kombucha drink. As you can see above, I’ve been experimenting with a few different flavors! Seriously, if I learned how to brew kombucha, you can do it too. Go forth and ferment! Ibotta is how I got hooked on Kombucha too ! I have followed your recipe and a Scoby has formed after 7 days (very thin) so I think I will let it go for a few more days. Thanks for sharing your processs. That’s so awesome Kathy! I’m glad it worked just as well for you as it did for me. I hope your batch turns out delicious! I can’t believe how easy this was … just as you said. My kombucha tasted awesome and I am now on my second ferment with my new SCOBY. I also bottled up the remaining kombucha from the first ferment (and added a little bit of fruit and I will refrigerate tomorrow). Thanks again ! Wow! I always been interested in making my own and this looks super easy! Very interesting. I’m not a scientist and don’t play one on TV. I like Kombucha, but have never thought of making my own. I am going to try this recipe. Thank you! I have read a lot about this and saw it being sold at the health food store, but haven’t taken that leap to try it out. I do wonder what it tastes like. That’s a great way to save money by learning to make it yourself at home! I have never heard of Kombucha before. This sounds interesting. This is something I’ve been wanting to try for a long time–I should get started! I’ve never heard of Kombucha but I’d love to try this. Are you the Liz from A Nut In a Nutshell? Haven’t heard from you for awhile. Hi Veronica! That’s us – we have rebranded a couple of times since A Nut in a Nutshell 🙂 I’m Liz’s daughter Chanelle. Yes! How are you?!!! So nice to see you! So glad to reconnect again! Looking forward to visiting your new blog. I’ll have to try this. I’ve never even heard of it. We’re very open minded with food and drink at our house. I certainly would love to give it a go.